Meryl Streep, the one actress over the age of 60 in the United States with the power to be in pretty much any movie she chooses, is moving on to the kind of biopic you'd joke about her starring in because it just seems too perfect. 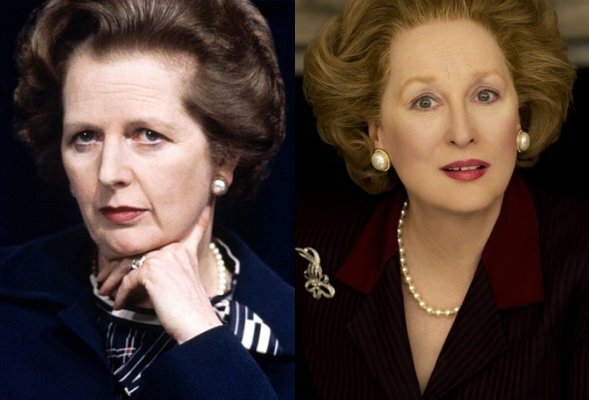 In The Iron Lady Streep will be playing Margaret Thatcher, the former Prime Minister of England who has become an icon of 1980s conservatism and smart skirt-suits. Streep's Mamma Mia! director Phyllida Lloyd is directing the film, which focuses on the 17 days that led to England's involvement in the 1982 Falklands War, which lasted only four months but resulted in the death of more than 250 British soldiers. Anyway, the question we all have now isn't how the movie will handle Thatcher's political legacy but how good Streep will look in the pearls-- and now the production team has released a first look at Streep in costume as Thatcher, which you can see below or in high-res at Deadline. You really only have to see the side-by-side comparison to realize that, once again, Streep has done a complete transformation into somebody else. They'll be unveiling footage from the film as they try to sell it at Cannes, so by then Streep will inevitably have nailed all the mannerisms and the accent and be cruising her way to a third Oscar. Not to make everything sound predetermined, but when you're Meryl Streep at this stage in her career, success is almost a constant guarantee.